Kitchen Valance - Sew What? Sew Anything! - Sew What? Sew Anything! In sewing, a bold fabric can be a blessing or a curse. This was a client choice for fabric and I really had to think about the best way to make this fabric selection work well on the kitchen valance. Don’t get me wrong, I loved this fabric, but we had to take extra steps to make sure that it looked right on the valance. Truly, this was a fun valance to make because my client said that she didn’t care what style I made for her. She had selected this great fabric so I wanted a valance design that would show-off the great fabric. Having a client that gives you that type of liberty can be really great or it can be really hard, as you know you have to surprise your client by making great window treatment that she will love. 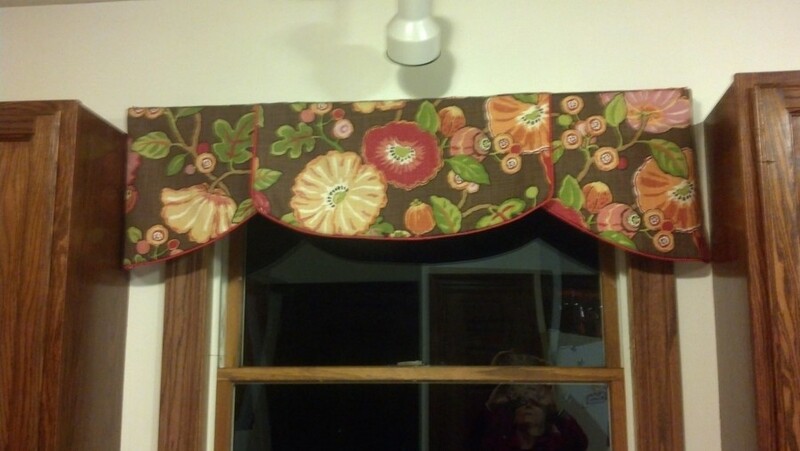 So, with some great coordinating fabric that I used for piping, I created this over the sink kitchen valance. We also made six coordinating chair pads for her dining room table.